Last weekend, our little family was invited to see an advanced screening of Rio 2. This time, we left N at home. She woke up feeling crummy, and when she vomited, we decided it didn't seem like a great idea to take her to a crowded movie theater. Of course, she was fine before we even left the house, but that's another story. 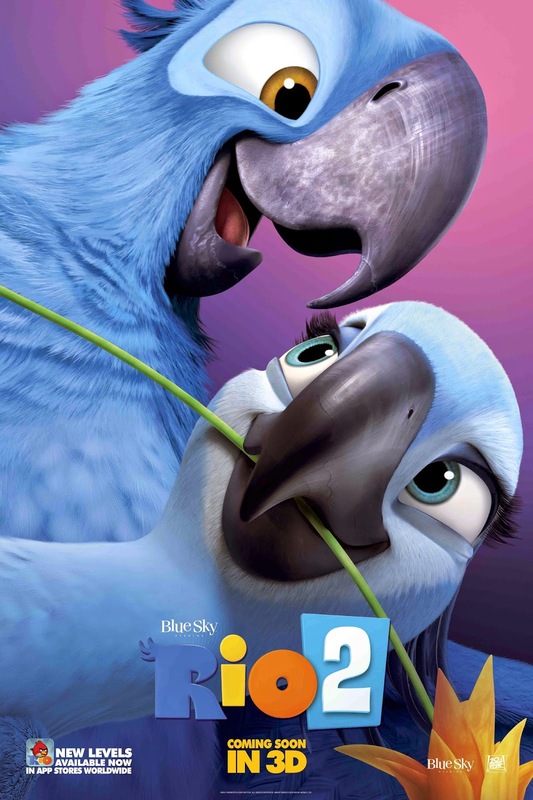 Rio 2 follows up on the story of Blu and Jewel - two macaws believed to be the last of their species. The story takes place 3 years later - the birds are "married" with kids, and their people (Linda and Tulio) are also married. It is quickly discovered that there are more blue macaws hiding somewhere in the Amazon. Blu and Jewel decide to investigate along with their human counterparts, and the story goes from there. I'll admit, I didn't dislike the movie, but it wasn't exactly my favorite. The music was great - aside from a few songs by the animal villains, which were a little... weird, to say the least (though not any weirder than some villain sung Disney ballads from when I was growing up). The story line was a bit of a mesh between Meet the Parents, and just about any film geared toward saving the environment and playing up the evils of not appreciating the environment. One thing my husband pointed out was the irony in how the environmentalists (Linda and Tulio, in this case) were portrayed as sort of bumbling through most the movie. Here's the thing, though - it's a kid's movie, and my kid really like it. In fact, he was already talking about wanting to see it again before we were in the parking lot. And when the original Rio came on tv the other night? My dad dvr'd it for the kids, and they've seen it twice now. That's twice in two days. For me, the more my kids genuinely enjoy a movie, the more it tends to grow on me. All in all, I would say it was a decent movie. There were good lessons to be taught about the value of family as well as staying true to yourself. There were a few times where I really did laugh out loud, too. And I have to say, I really enjoyed the pop-up book graphics in the flight montage from Rio to the Amazon. There's a lot of beautiful imagery throughout, actually. So... maybe a matinee with the kids? Or wait until it's available on dvd. Either way, I think your kids will enjoy it. G certainly did. What new movies have you seen lately? Anything coming out soon that you're really excited for? I received free admission to this movie for myself and my family, but was not compensated in any way for writing this post. As always, all views and opinions are my own.